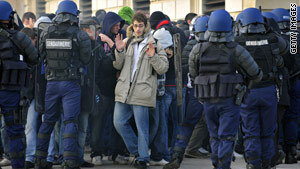 French police try to restore order as Marseille and PSG fans clash. (CNN) -- France's football league president has said the decision to postpone Sunday's match between PSG and Marseille because of swine flu was not the catalyst for violent clashes between rival fans. Frédéric Thiriez has defended his decision to call the Ligue 1 game off after PSG players Ludovic Giuly and Mamadou Sakho were diagnosed with the H1N1 virus on Saturday. The club later confirmed a third case and said two members of the coaching staff were also carrying symptoms of the bug. The late postponement of the game sparked trouble on the streets of Marseille as riot police used tear gas to keep the two sets of fans apart. Marseille president Jean-Claude Dassier criticized the decision but Thiriez insists he made the correct call. "If I'd gone against the medical experts, people would have thought I was mad or, worse in my position, trying to do the dirty on one of the clubs," he told L'Équipe. "To suggest they [crowd disturbances] are linked to the match being put back is deliberately misleading. Unfortunately, these incidents were planned. "What would people have said if the match had gone ahead and the Marseille team had caught the virus? The medical commission gives us their professional opinion. We have to follow it as much as we can." Thiriez insisted the postponement was decided upon because "player safety is more important than any other consideration." No date has been announced for the rescheduled game. What would people have said if the match had gone ahead and the Marseille team had caught the virus? Meanwhile, English Premier League club Blackburn Rovers have confirmed three of their players and two coaching staff have gone down with the virus. Christopher Samba and midfielder David Dunn missed Saturday's game with Chelsea. When asked if the pair were suffering from the contagious disease manager Sam Allardyce replied: "It's definitely swine flu -- you've speculated on the names and I'll leave it at that." Allardyce said Premier League rules prevented the club from attempting to postpone the game at Stamford Bridge. He also admitted there was a chance the virus could have been passed on during the match. "The Premier League has tried to sit on the fence by saying that we didn't request to have the game called off," added Allardyce. "We knew we couldn't get the game called off because we were told way back in February or March when we took some guidelines that unless there was some government legislation, everybody had to do whatever they had to do. "If there was a swine flu outbreak, you couldn't call a game off, no matter what. We fulfilled our responsibility by confirming two cases of swine flu and suggesting that it looks like one or two other players and members of staff had similar symptoms -- and we made the same phone call to Chelsea."